Use Worx4 X to prepare projects to be archived or sent to another workstation or facility. Any application that can read an FCP X v1.6 or 1.7 XML should be able to open the new consolidated project. Worx4 X is a new application for users of Apple FCP X, which solves the problem of needing to consolidate, and trim media used in one or more Projects. Worx4 X takes an FCP X XML that contains a single Project. It finds all the media references, adds handles, joins any overlapping references and then copies just the used portions to a new folder. Finally it writes the XML back out, but having adjusted the media references to point to the new trimmed media, and all the start times of the references to reflect the new trimmed lengths of the media. WAV or AIFF files will not be trimmed if the preferences are set to 'Copy audio files without losing metadata'. Please set this option on first installation. The first version of Worx4 X can trim the vast majority of routine Final Cut Pro X projects. 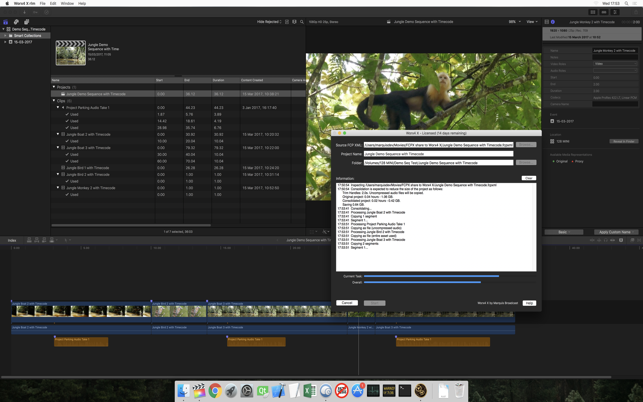 It cannot trim everything that FCP X can create in a project. >	Worx4 X will not currently trim either MXF, M4A(AAC), AC3, CAF or mp3 media files, the whole file will be copied. 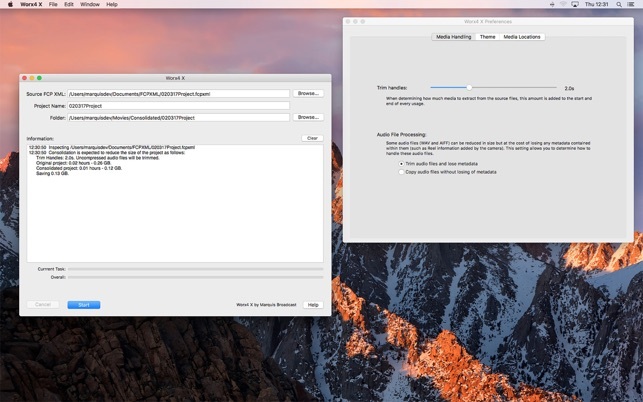 >	QuickTime reference files will not be trimmed, the reference files are copied to a new directory, but will still reference QuickTime files in their original location, which will not have been trimmed and would potentially go off line if the new project is moved to a different workstation. We recommend you do not use Worx4 X on projects that use QuickTime reference files. >	Compound or MultiCam clips are copied in their entirety, media file which are longer than these clips will be trimmed to the length of the original Compound or MultiCam clip. 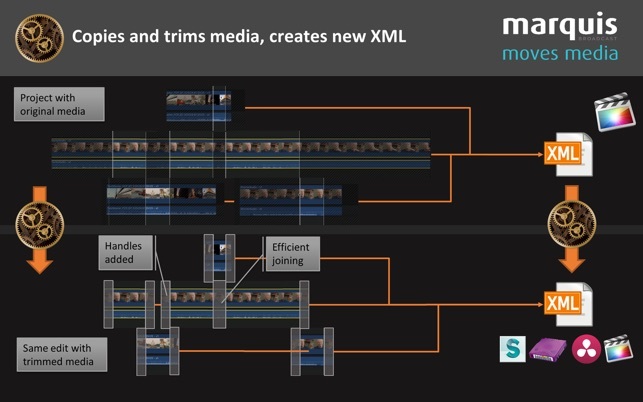 However, breaking apart Compound clips will allow the media to be trimmed to that used in the timeline. >	Sync clips that contain a video clip and one or more audio clips, which entirely cover the used portion in the timeline will be trimmed, Sync clips that do not meet these criteria will be copied in their entirety. Breaking apart such Sync clips will allow the media to be trimmed. Bug fix. Prevent a crash that occurred with missing assets. After a few months of using it I can tell this app isn’t doing the ONE thing it's suppose to do. No matter how much I tried, no matter which kind of media I’m using. The trimmed libraries its produced are MUCH bigger than they suppose to be. And yes, I did sent different kind of projects to the Worx4 X support, the did tried to help but they couldnt fix the problem. Friend of mine who tried it on her projects have thesame conclusion: The program just not working as it should. The last time I checked was today. I hoped the new version will fix the problem but it was not. I love when a program that aim to do one thing, do it perfect (I hate when it's not). I've used this app for a few big projects and all went simless. The one thing I'm not a fan of, that its adding "Copy" to the names of all of the new files created in the process. I don't see a reason for it and other programs (including old FCP7 Media Manegar found a better solutions for it). It become worse when you continue working on the trimmed project and after a while you want to trim it again. Now you have double or triple "copy" at the end of the file names. It's become messy. Also I would like better if the option to select Handles will be on a project level, not on the general preferences. It make more sense that way. Having said that, it is still great app that just work. Sorry to hear you are unhappy with Worx4 X. Can you please get in touch with us through our support forum at forum.marquisbroadcast.com and our support team will be able to try and help you resolve the issue, alternatively you can reach out to Apple for a full refund. Fulfills a great need. Simply works! By the time I have finished a project I have a million files all over my source drive, desktop and a myriad of other places. Half of the files are not used in the project but I would love to be able to archive the project and make sure that all of the files are in one place and I’m not storing a bunch of files that weren’t in the project. Plus many 2 or 3 hour long clips only have small snippets that are within the project. This app fixes all of that. Thank you for your great review. We are so pleased that you are pleased with our App! Keep Worx4 X-ing! Just started experimenting with this and, although still a work in progress, find it very helpful. Very easy to use. I’m working on a project with many types of media at different frame rates and 99% of it works great. Had to adjust a few clips and relink a few others but it still helps greatly in reducing your media storage size. Took my demo reel project from 450GB to 35GB in only a few minutes. Once a few bugs are worked out this will be a very useful app for our studio. Thanks for your review! We are pleased you are finding Worx4 X helpful and easy to use! We hope you keep enjoying Worx4 X! !